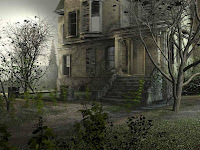 Halloween Real Estate Marketing Ideas: A Spook House! Sponsor a Halloween haunted house, probably one tailored more to families than teenagers. While it is not wise to do this in one of your real estate properties, you could go in with some other businesses and rent a place. The publicity will be great. Be sure to pass out treat bags with your business card in it at the exit of the house!